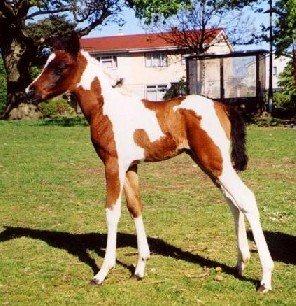 Bay tobiano filly Apache Whisper. Thankyou to Bonnie Lovell for allowing me to display a photo of this lovely filly. She is a daughter of Bonnie’s bay tobiano stallion Apache Jacob, standing at Arabus Horses & Ponies (Hampshire, UK), and Arabian mare Masala. She is also full sister to Apache Fable who is shown in the next photo.